With the emergence and widespread adoption of online or digital marketing, more traditional methods of advertising have generally become more expensive and less effective...for many. There are still many reasons why a business would engage in offline marketing in newspapers, on billboards, through direct mail or on television or radio. Because of the higher cost of many of these advertising formats, it is imperative that you have a very clear marketing strategy. Your efforts must be consistent, relevant to the audience, at the right time and in the right place, and have a clear call to action. A question I get a lot when I speak with business owners is "Just tell me, what marketing really works?" and I often tell them that all marketing can "work", because it is not the vehicle, it's the content (and the context). Display advertising are tactics like running and ad in the newspaper or in the Yellow Pages book or renting space for advertising on a billboard. Before advertising surrounded us, these methods of building awareness were very effective. Back then, the way people learned more about a product or service was to speak to a sales person, either at the store or on the phone. Now, people are much more accustomed to looking up information online, so "Call Us Today To Learn More" has become less effective as a call to action. 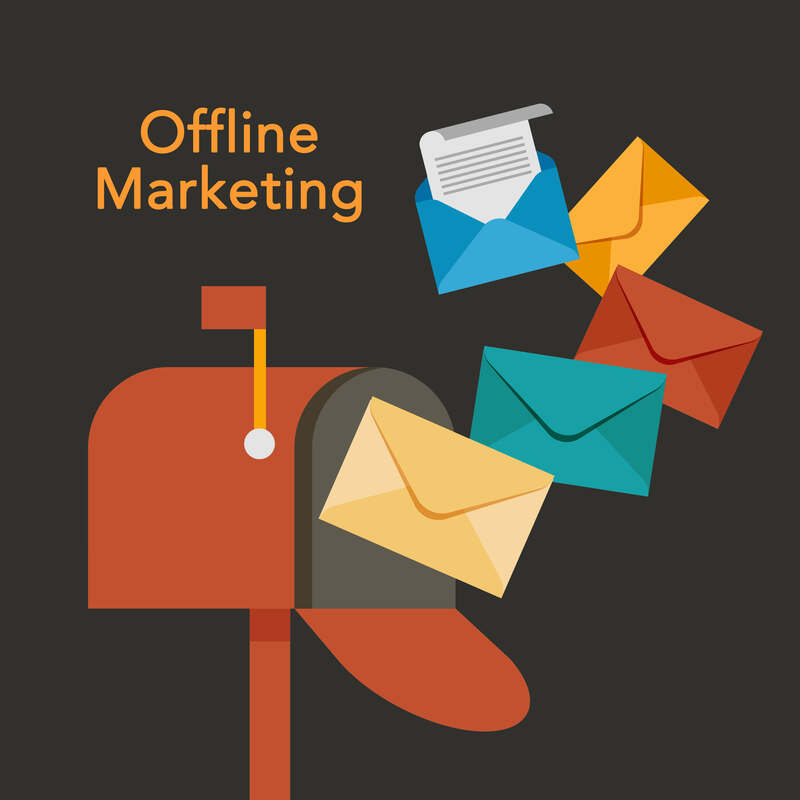 But with the right call to action, in the right format, and at the right time these types of offline marketing tactics can be marketing gold. Postage isn't cheap...so the days of buying a mailing list and sending out a direct mail campaign to a broad audience are over for everyone except those with a lot of money to waste. There are many ways to create or acquire a much more targeted list of addresses for current or prospective customers. Targeted lists are the key to saving money and increasing return on your direct mail campaign. A good and cost effective example is the Every Door Direct Mail (EDDM) program offered by the U.S. Postal Service. It offers a discounted postage rate for mailings to mail routes that you can specify, and includes some high level demographic information (home value, percentage of residential vs. businesses, etc.). This is particularly useful if you are a local business that wants to reach a specific type of audience in your area. There are many other creative ways to use direct mail to connect with your customers, and we have worked with many clients to build mail campaigns that are designed to deliver the results they want...and within budget. Tivo, DirectTV, Sirius, Netflix, OnDemand, iPhones..."What is 'The things that changed radio and television advertising the most', Alex"
This topic is a little bit of a hot-button for me. There is so much possibility and opportunity for television and radio advertising, BUT there is so much money wasted (BILLIONS of dollars) on ineffective advertising. I know you have seen ads (or maybe you haven't since you've had a DVR) that are wildly entertaining, so much so that they may have gone viral on YouTube, and yet you still don't know what the advertisement is for and what they sell! Congratulations, you just spent millions of dollars to entertain thousands of people. (Thank you, by the way- whoever you are). I also know that you have seen ads that are of questionable quality and feature a very stiff business owner...and you may have had some pity, but you probably also decided not to seek them out for their services (whatever those services are, you were so distracted). Just like all other types of offline and online marketing, television and radio advertising are best when they can be targeted (particular audience, at a particular time, surrounded by other relevant advertising or events), measured, and created with a clear call to action (what do you want them to do right now?). Sponsorships are basically a donation that is given with some opportunity to promote your business in return. They are the advertisements on banners at your child's baseball field, the company on the t-shirts of 5K races, the businesses mentioned at large conference, etc. Usually the cost of a sponsorship is used to subsidize the operations of the group that received the sponsorships (i.e. the refs at the games, the race timers at the 5K, the speakers and venue of the conference). As a thank-you for helping them out, the organizations give the sponsors the right to promote their company. In most cases there are different levels of sponsorship that come with different levels of promotion (and exclusivity). The best use of a sponsorship opportunity is to support a cause that is important to you, your business, or maybe most importantly, your customers. They are very nice ways to live by...and demonstrate, what you value as an organization. No business is an island. Every customer you have is considering buying from or actively buying from other businesses. For products and services that you have, and for products and services that they need but you do not offer. Instead of operating all by your lonesome, why not consider partnering up with businesses that are complimentary to yours and who serve the same customer? Think AT&T and iPhone back in the day (AT&T was the only company that Apple supported), Starbucks and Barnes & Noble, the bank in your local supermarket, etc. The benefits of forming a strategic partnership with another business include shared advertising costs and the opportunity to share customer lists for targeted promotion. You can also learn a lot more about your ideal customers by combining your insights on their buying behavior and their customer service experiences. Speaking in front of groups is not right for everyone or for every business, but it can be very a very powerful way to demonstrate your knowledge, educate a prospective customer base, and build trust. Speaking works particularly well for service based businesses like accountants, engineers, physicians and chiropractors, consultants, etc. The purpose of a speaking engagement is to provide a service and to educate...not to sell and convince. Who doesn't want opportunities to help others? Almost every business has the need for written marketing materials that can be handed out or sent electronically. These materials are useful for visually demonstrating your product or service, answering FAQs, telling your customer's story, and presenting your unique difference. This collection of materials (flyers, letters, etc.) are called a Marketing Kit. The entire kit should be developed from the perspective of your marketing strategy (using words, information, stories, etc. that resonate with your ideal customers), and then designed for look and feel. Not the other way around...what good is a flyer that looks nice but sounds like everyone else and doesn't have a call to action? No good. Just shoot us your email and we will send you the free guide "7 Steps to Small Business Marketing Success". Learn the seven steps every business owner must take to get the best results from their marketing dollar.